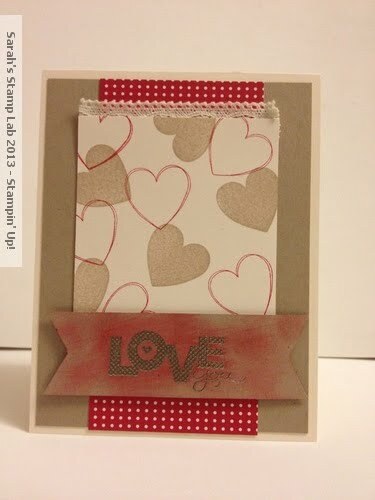 Yesterday I held my annual Valentine's Class featuring the Hearts A Flutter Stamp set. The projects from that class will be posted beginning next Monday. Today I have a Valentine that I made for the Fab Friday Challenge Blog. This is the sketch that was posted to inspire us. Don't forget to click on the Promotions tab above to see the new Sent with Love bundle! What an adorable card! You could use that sketch for a scrapbook layout too! Sweet! Love the trim peeking out from the top panel! Thanks for sharing with us at Fab Friday!